bSix12 – Do what makes you happy! » Is Your Office Chair Killing You? These symptoms are all normal, and they’re not good. They may well be caused by doing precisely what you’re doing – sitting. All of these can be symptoms of not having a proper chair to sit in when doing desk work. Research in the diverse fields of epidemiology, molecular biology, biomechanics, and physiology is converging toward a startling conclusion: Sitting is a public-health risk. And exercising doesn’t offset it. "People need to understand that the qualitative mechanisms of sitting are completely different from walking or exercising," says University of Missouri microbiologist Marc Hamilton. "Sitting too much is not the same as exercising too little. They do completely different things to the body." Feeling first signs of the above mentioned symptoms I was looking for a new office chair and came across Herman Miller’s Aeron. 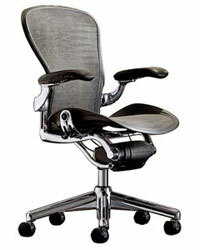 The Aeron Chair is a popular office chair introduced by Herman Miller back in 1994. The chair is popular for its ergonomic design, which ensures comfort and an excellent fit for the user. It is definitely one of the best chairs around for computer users and for general office use and use in meeting or conference rooms. "The human form has no straight lines, it is biomorphic. We designed the chair to be above all biomorphic, or curvilinear, as a metaphor of human form in the visual as well as the tactile sense. There is not one straight line to be found on an Aeron Chair." says designer Bill Stumpf. Its novel design has gained it a spot in the Museum of Modern Art’s permanent collection. Have you ever wondered why people purchase a high-end chair like the Aeron even if it costs nearly a thousand dollars? The answer lies in the health benefits. If you get the right size and adjust it properly, most people can sit in them all day long without feeling uncomfortable. Other popular high-end chairs to look at are Herman Miller’s Mirra, the SwingChair, the Ergohuman Mesh Chair and the Liberty Chair from Humanscale. Many office workers swear by them. But are those high-end chairs worth the money? What do you think? I bought my Ergohuman Chair from http://www.ergohuman.info a while back. It has been a good chair and I am considering another for my work. I am still trying to decide whether to go with the normal one or the new v2. Anyone had an experience with it yet?